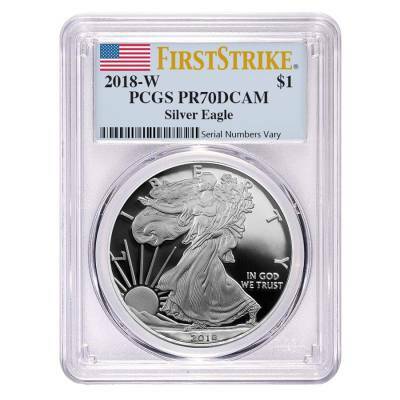 This splendid 2018-W 1 oz Proof Silver American Eagle PCGS PF 70 Early Releases is the latest proof edition in the timeless Silver Eagle series which is graded by PCGS within the first issuance month as displaying a spectacular sharp striking. The well-known United States Mint released the first bullion and proof Silver Eagle in November 1986 and both versions carried the renowned design of the 1916-1947 half-dollars - the Walking Liberty image. 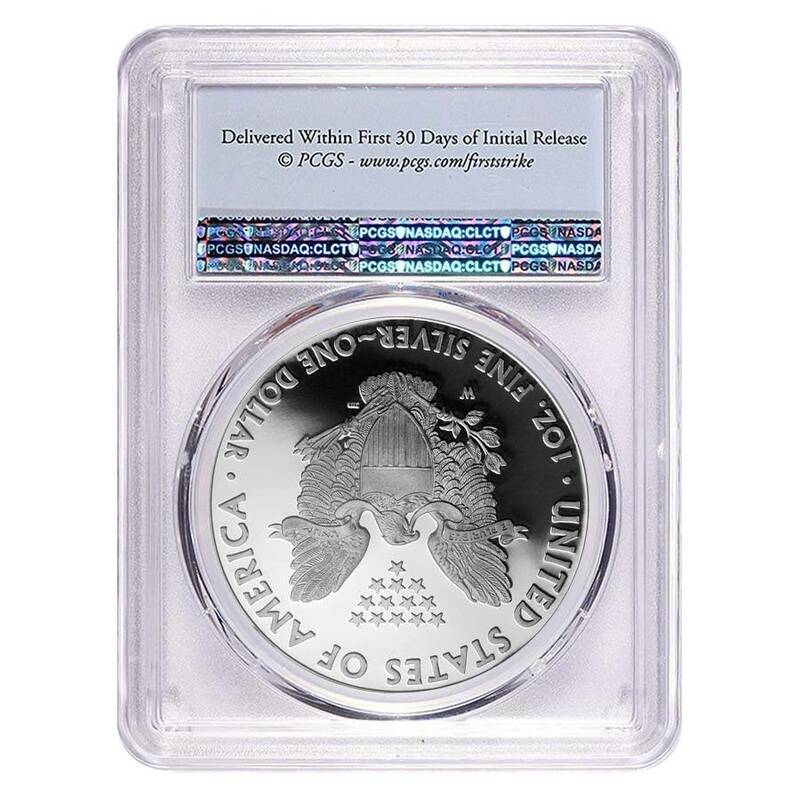 The proof coins are minted using special dies and blanks, as well as multiple striking, in order to confer a sharp, brilliant finish beloved by collectors and investors all over the globe. Moreover, unlike bullion versions, the proof editions struck from 1986 to 1992 carry the “S” mintmark (San Francisco), from 1993 to 2000 - the “P” mintmark (Philadelphia) and the newest issues from 2001 - the “W” mintmark. Only in 2009, there were no Proof Silver Eagles minted by the US Mint. This outstanding piece was received for grading by PCGS within the first mintage month and was certified as having no imperfections noticeable under 5x magnification. Being a cherished collectible, this superb coin is a treasured gift and an excellent addition to any bullion portfolio. Made from .999 pure silver with a weight of one troy ounce. Struck by the preeminent US Mint at the West Point. Produced with a mirror-like proof finish. Carries a $1 USD denomination. PCGS PF 70 UCAM Early Releases: Comes with a proof finish, bearing the original luster, a sharp contrast and no imperfections visible under 5x magnification. Graded within the first mintage month. Obverse: Showcases the renowned Lady Liberty confidently moving towards the sunrise holding a laurel oak in her left hand and her body wrapped in the US flag, surrounded by the inscriptions “In God We Trust”, “2018”, and “Liberty”. Designed by: Adolph A. Weinman. Reverse: Depicts the majestic heraldic eagle holding a shield, an olive branch, and arrows, along with the thirteen small stars, along with the denomination, purity, weight, and mintmark, and the words “E Pluribus Unum” and “United States of America”. Designed by: John M. Mercanti. Bullion Exchanges offers you an incredibly beautiful selection of spectacular proof silver coins from the most prestigious mints. 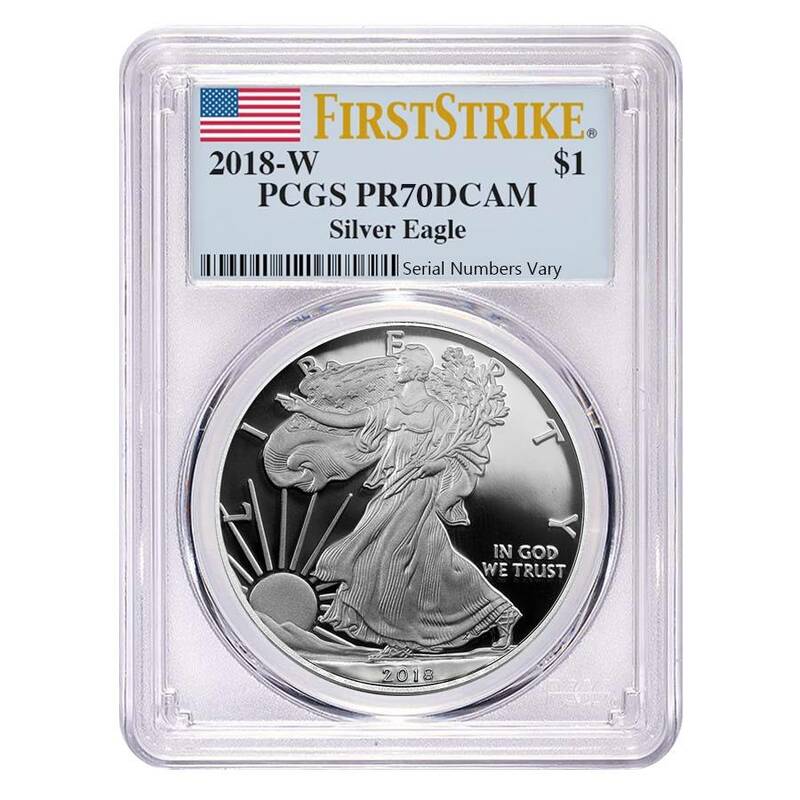 Add this exceptional 2018-W 1 oz Proof Silver American Eagle PCGS PF 70 First Strike to your portfolio today, and it will be carefully packaged and shipped to your address in no time. If you have any questions, just send us a message or contact us at 800.852.6884, and we will be happy to assist you. With this purchase, you earn 79 Bullionaire Bucks 79 BB = $0.08. We currently have 76 of this item in stock. For every $1 spend, you will earn 1 Bullionaire Buck which is equivalent to $0.001 off a future purchase. 79 BB = $0.08.